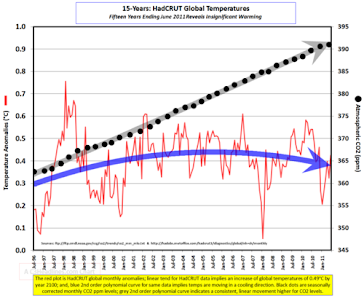 Joseph D’Aleo and Anthony Watts have delivered a block-buster paper which in it's entirety attacks the very foundation of the Global Warming scare - the temperature data on which the edifice rests is inaccurate, flawed and tampered with to such an extent that no reasonable scientist would use it. 4. Global terrestrial temperature data are compromised because more than three-quarters of the 6,000 stations that once reported are no longer being used in data trend analyses. 5. There has been a significant increase in the number of missing months with 40% of the GHCN stations reporting at least one missing month. This requires infilling which adds to the uncertainty and possible error. 6. Contamination by urbanization, changes in land use, improper siting, and inadequately-calibrated instrument upgrades further increases uncertainty. 7. Numerous peer-reviewed papers in recent years have shown the overstatement of observed longer term warming is 30-50% from heat-island and land use change contamination. 8. An increase in the percentage of compromised stations with interpolation to vacant data grids may make the warming bias greater than 50% of 20th-century warming. 9. In the oceans, data are missing and uncertainties are substantial. Changes in data sets introduced a step warming in 2009. 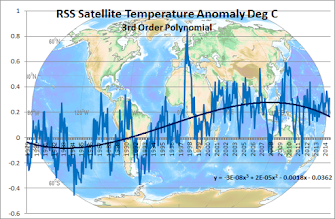 Satellite measurements since 1979 show a .5 decree Centigrade anomaly divergence from the highly massaged terrestial- based figures which represents the major part of the supposed "warming trend"
The data of stations located in areas not listed in the Hadley Climate Research Unit Temperature UK (HadCRUT) survey often show no substantial warming in the late 20th century and the early 21st century. The HadCRUT database includes specific stations with incomplete data, highlighting apparent global warming, rather than stations with uninterrupted observations. The Russians concluded that climatologists used the incomplete findings of meteorological stations far more often than those providing complete observations. These stations are located in large populated centers that are influenced by the urban warming effect. This created 0.64C greater warming than was exhibited by using 100% of the raw data. Given the huge area Russia represents, 11.5% of global land surface area, this significantly affected global land temperatures. The ever-warming temperature bias is accentuated by the removal of "cooler" stations from the data base. Every adjustment seems to only go one way so the total bias is unidirectional. This paper should be shown to every politician in every country to arrest the false warming catastrophism consuming the globe!